The motorsports side of the off-road hobby has grown tremendously over the past decade. With the launch of events like King of the Hammers, it has incited a new level of technology and build theory into the ‘wheeling world. As is the case for many auto-derived competitions, the technology learned on the track eventually trickles down to the recreational side of the hobby. A great example of this can be found in Loren Healy’s 2013 Jeep Wrangler Unlimited. While the two-time King of the Hammers champion is most known for dominating the Ultra4 race series in his Red Dragon buggy, the proud husband and father of three wanted something a little more refined to take his family down the trail in. Of course, a stock Wrangler wasn’t going to cut it. So, Healy reached out to one of the biggest names in the Jeep builder world- Off Road Evolution. 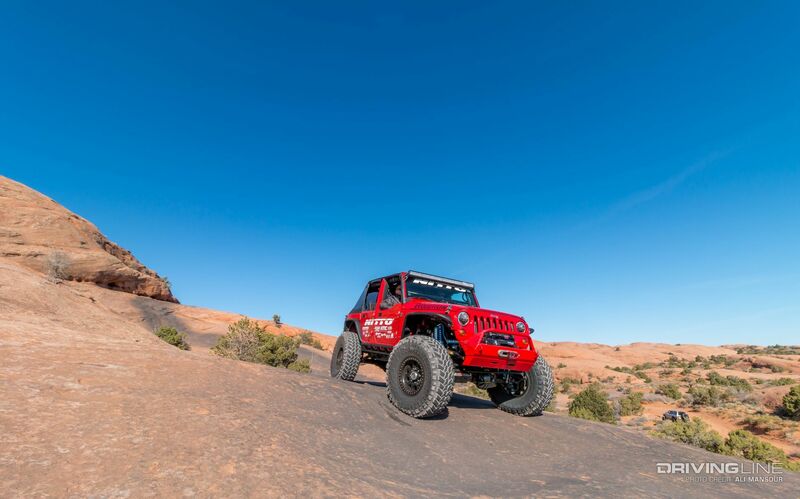 Working with EVO owner Mel Wade, the two devised a build plan that would fit the Jeep with race-proven components for sheer durability, while retaining all of the creature comforts that make the four-door JK platform such a desirable vehicle. Under the hood rests the stock 3.6L Pentastar V-6. 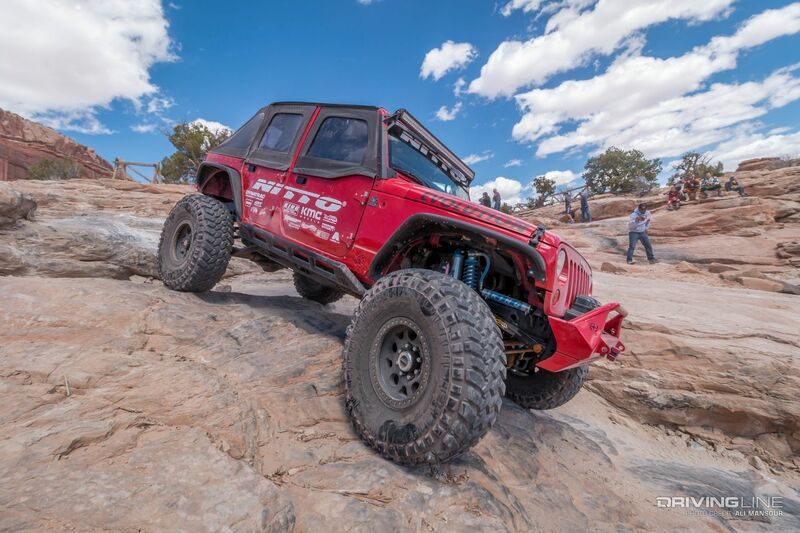 The estimated 285 horsepower is a far cry from the fire-breathing V-8 powering his race car, but it works fine to get the JK down the trail. Replacing the stock front axle is a Dynatrac ProRock 60. This high-pinion front differential is stuffed with 5.43:1 differential gears and an ARB Air Locker. To increase steering control, a hydro-assist steering system was installed from PSC Motorsports. This works excellent with the Off Road Evolution high steer setup. Allowing Healy to mimic race speeds in the dirt is an EVO Manufacturing Double Throwdown long-arm suspension system. This setup fits a 12-inch-travel King coilover and bypass shock at each corner. The EVO-specific valving is tuned to optimize high and low speed control. Despite the relatively low lift height, this setup offers an impressive five inches of up travel, with a true seven inches of down. Adding to the stability of the rig are front and rear PAC sway bars. Splitting the power to the 1-ton differentials is an Advance Adapters Atlas II transfer case. Healy opted for a 4.3:1 low range, which works well for the majority of the west coast rockcrawling around his Farmington, New Mexico, home. Delivering the drive power are J.E. Reel drivelines built with 1350 double-cardan joints and rock-resistant 0.120-wall tubing. Out back, it doesn’t get any beefier than a Dynatrac ProRock 80 rear axle. Like the front, the full-float assembly is packed with a 5.43:1 gear set and ARB Air Locker. The trick suspension setup you see is from EVO Manufacturing. It’s called the EVO Lever and provides 14 inches of vertical wheel travel thanks to a cantilever-configuration. Since it’s part of the Double Throwdown EVO family, two King 2.0 coilovers, along with two massive 3.0 King bypass shocks were nestled cleanly underneath. The biggest advantage of this suspension system is you can have all of the travel and performance benefits of a coilover/bypass setup, without sacrificing any cargo area. 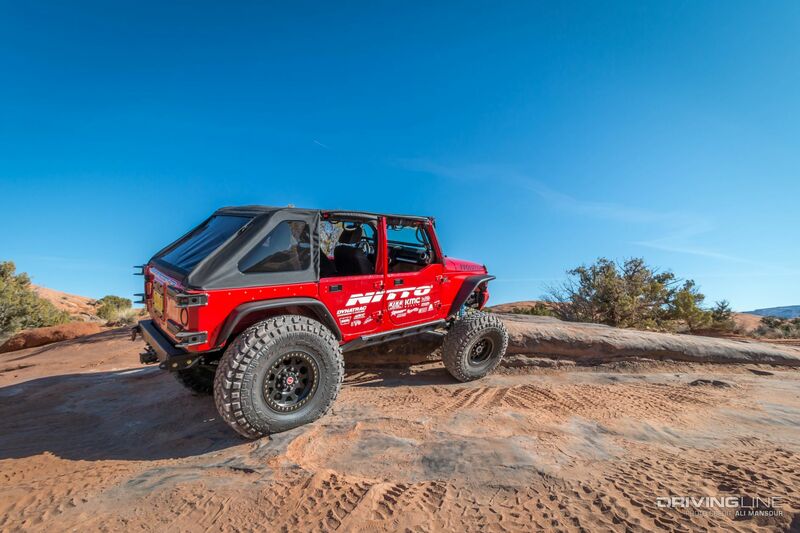 Traction comes thanks to 40x13.50R17 Nitto Trail Grapplers. These 40-inch mud-terrain radials have proven to be extremely durable in the dirt and refined on the road. Paired up with the heavy-duty treads are 17-inch Enduro beadlocks from KMC wheels. To keep the family riding in comfort, Healy opted to leave the plush interior of the JK mostly stock. Just in case, a bolt-in sports ‘cage was added for occupant protection. 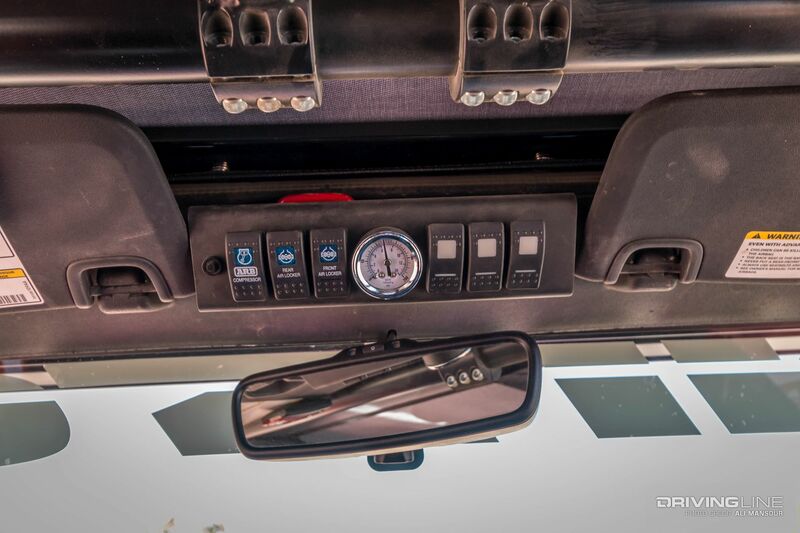 Just above the rear-view mirror you’ll find an sPOD switch panel, which provides easy access for the selectable ARB Air Lockers and Rigid Industries LED light switches. Weld-on EVO Mfg. rock sliders protect the four-door’s tub and work great with the color-matched EVO Rock Skins. 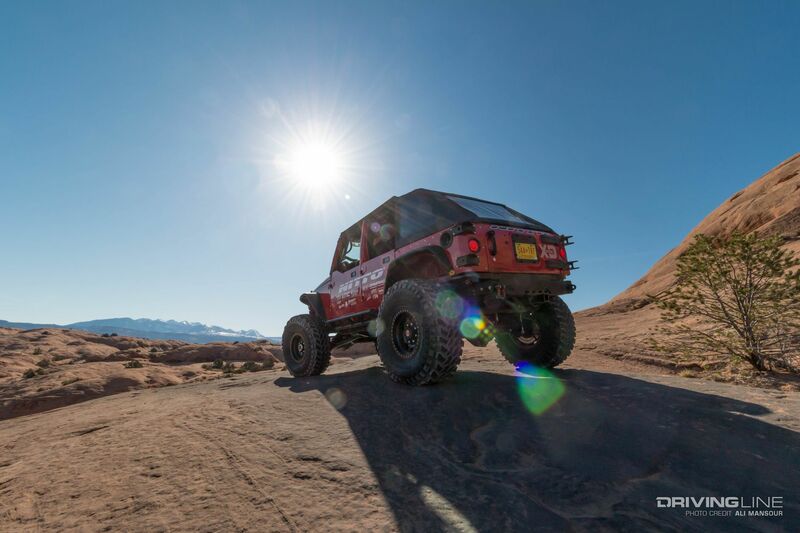 Healy’s JK is equipped with the high-clearance EVO long arm, which tucks the rear lower control arms alongside the frame. For those times when Healy needs a little extra assistance on the trail, a Warn PowerPlant winch was secured inside of an EVO Pro Series front bumper. Lighting the way are Rigid LED headlights. It didn’t take Healy long to get comfortable behind the wheel of the Jeep. 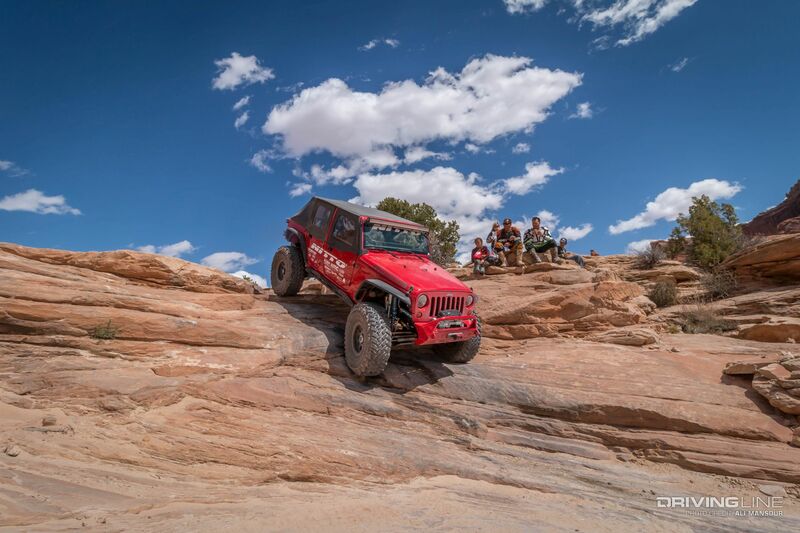 With a wheelbase and tire size that’s extremely similar to his Red Dragon, the accomplished wheelman was pushing the JK to its limits the first day on the trail. See video of the rig getting twisted off-road here!